The wars of the past have been long forgotten. For centuries, there has been a peace between the powerful Mages that inhabit the land, but that peace is about to be broken. Soon, these welders of magic will do battle to harness natural powers of the Earth and gain control of ancient locations. 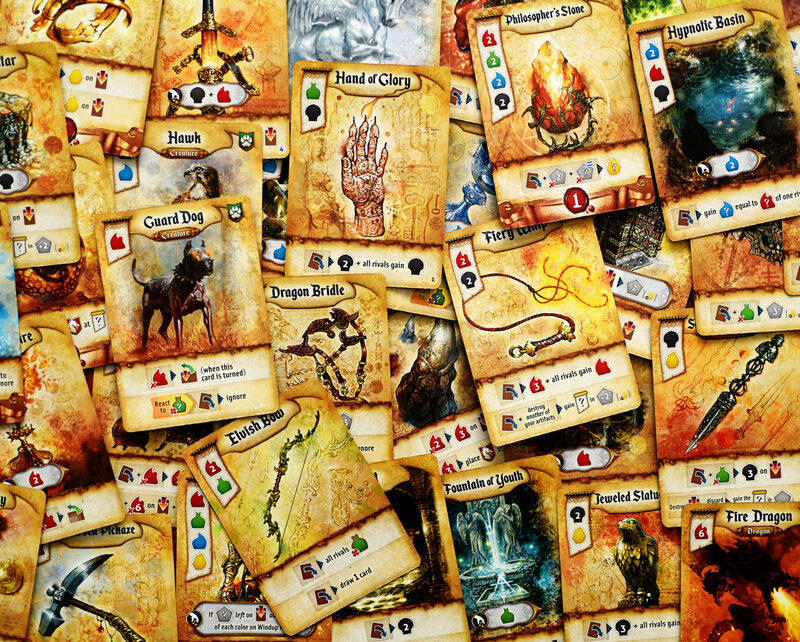 Res Arcana is the new game by Tom Lehmann and Sand Castle Games. I have always been a huge fan of Lehmann’s Race for the Galaxy, so I was pretty excited to play this new design. I actually got a sneak peek about a year ago, and have been waiting to get my hands on it ever since. You take on the role of a Mage using Essences to play cards to your tableau and fighting it out with the other players in a race for 10 points. At the beginning of the game, you select five of the 10 Places of Power to battle over. These sacred spots are expensive to get your hands on, but they have a point value that can often be boosted throughout the game. You’re dealt eight Artifacts and two Mage cards. Now, those Artifacts are the main things you’re going to build your tableau with, but you’ll never get any others. You have to make an efficient engine out of the original eight. Artifacts can be used a couple different ways, so even if one doesn’t fit with your strategy, you can find a was to use it. After examining your Artifacts, you shuffle them and draw a starting hand of three. Of the two Mages you were dealt, choose one of them. 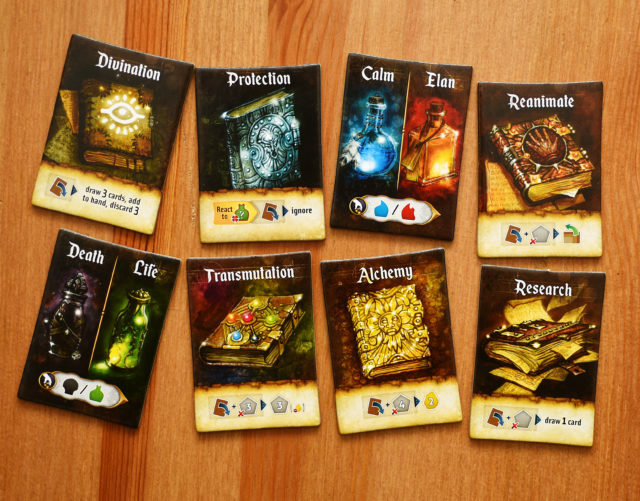 The Mages all provide some ability that will help you throughout the game. Many will provide you with Essences (the magical currency of the game), but some will give you other abilities, like drawing cards or avoiding attacks. You’re also going to get to start with one of the eight Magical Items in the game. These will give you an ability for the current round, but you’ll swap then out when you pass, so you’ll have to take advantage of them while you have them. At the start of a round, everyone gain Essences for the ‘Collect’ symbols they have on their Artifacts, Magical Items, and Places of Power. You can also take Essences you’ve placed on components on previous turns. Essences come in five types; Elan, Life, Calm, Death, and the rare Gold. After collecting Essences, you take turns paying for Artifacts from your hand, claiming Places of Power, using an action on a card in your tableau, discarding an Artifact for a Gold or any two other Essences, or passing. Aside from Places of Power, you can also claim a Monument. There is a separate deck of Monuments that each cost four Gold. They usually have a power to them and they’re worth between 1-3 points. If you’re the first person to pass in a round, you take the first player marker. It means you get to start the next round, but it is also worth a point, so may be enough to push you over the top if you’re close to 10. When you pass, you also exchange the Magical Item you had that round for one from the middle. You turn your used item face down and it can’t be picked that round by another player, so the sooner you pass the more options you’ll have to pick from. In the games that I played, passing sooner was often a wise decision. You also get to draw one Artifact, which is excruciating if you’re waiting for a certain card to come up. 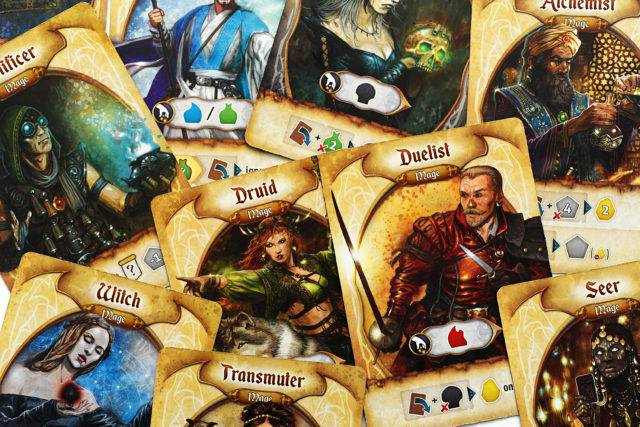 The powers on the various components range from allowing you to cycle through your deck, to changing up your Essences, and allowing you to attack or defend from the other players. When an attack is made, it’s usually for the Life Essence. If you can’t defend you have to lose it, and if you have none, you must lose TWO other Essences for every one you’re short, even Gold. It can be devastating, as I learned in my most recent game. I was taking attacks from all sides and had little in the way of Life production. Some Places of Power are worth points equal to the amount of a certain type of Essence you can place of it. The Catacombs of the Dead, for example, is worth one point for every Death Essence on it. For an action, you can use its power to place one Death on it, or you can spend five Death to place one Death on it without using its power, allowing you to pump several points into in one round. Before going too much further, I have to mention the incredible artwork by Julien Delval. He created an entire world in the different cards and it’s one I want to explore further. 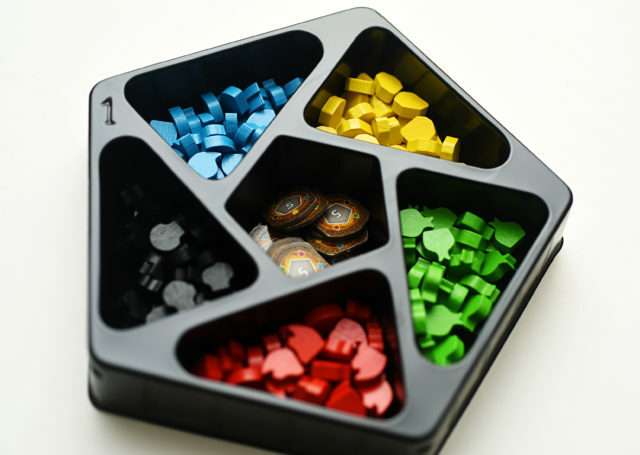 The Essences are nice wooden pieces and they come in a super handy game tray that make gameplay and storage really easy. If this is what we can expect from Sand Castle Games, I’m looking forward to seeing what they do next. Res Arcana is a lot of game in a small box. 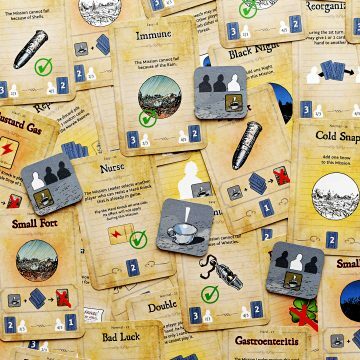 It plays quickly but there are interesting decisions throughout, and you’re going to want to play it again and again to look for different synergies in your cards and different tactics to apply. If that sounds like Race for the Galaxy, it is, but don’t be fooled. These are very different games. They just both happen to be super fun and highly replayable. Res Arcana has quickly climbed my list of favourite games of the year so far. I highly recommend checking it out. 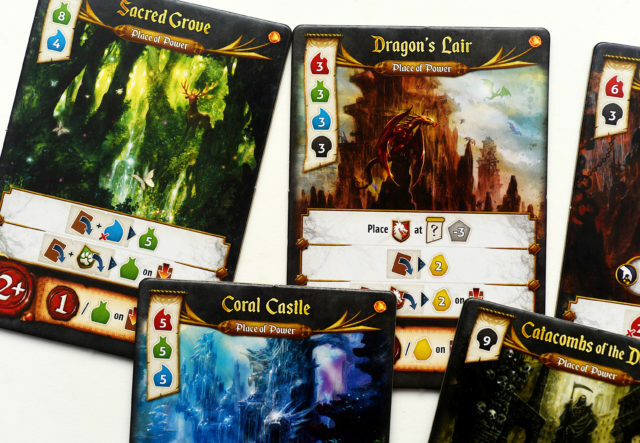 Res Arcana is a competitive card game for 2-4 players. Games take between 30-60 minutes. A review copy was provided for this article. 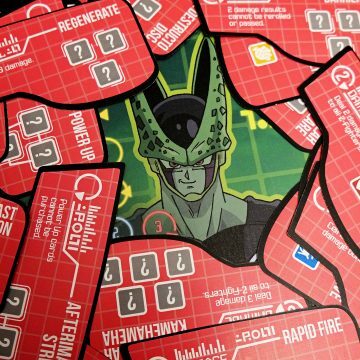 Dragon Ball Z Perfect Cell: SUPER ATTACK!